As the microchip revolution took root in the late 1960s, one of the most obvious uses for the new miniaturization was in the field of mathematics. Digital computers’ original tasks had, of course, been related to calculating much faster than deskbound human beings. The power of a once-massive digital computer transferred to a handheld device would allow for a revolution in calculation, allowing mathematicians of all stripes, from accountants to engineers, to free themselves from lengthy and difficult slide rule calculating. 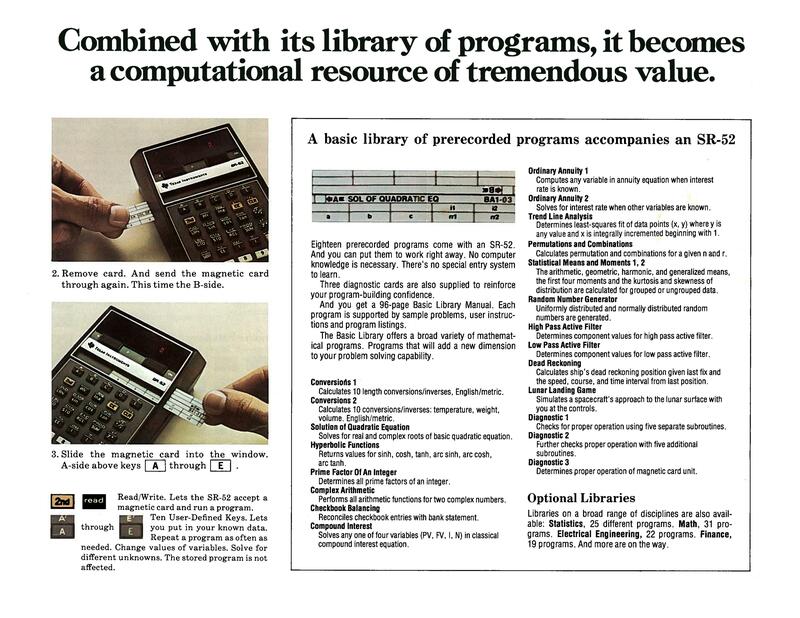 Moreover, pocket calculators were becoming powerful enough to allow for algorithmic calculation: a programmable list of tasks that could solve multi-function, multi-step formulae quickly. 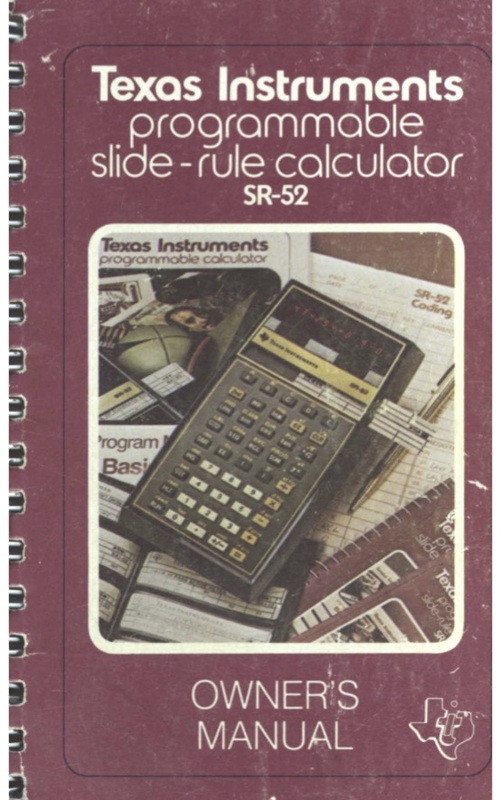 So it’s no surprise that Texas Instruments tried to cushion the future shock of the programmable capability of their first off-board memory calculator by informally calling it a “slide-rule calculator” on the cover of its Owner’s Manual (the “SR” in the model number stood for “Slide Rule”) of the TI SR-52 (1975), the company’s first venture into the programmable calculator market (then dominated by Hewlett-Packard). The SR-52 used an ingenious system of magnetic cards, which had been pioneered at IBM in the late ’60s and early ’70s, to store the user’s programs. These long and thin cards slid into the calculator much like one of the rules of a slide rule. 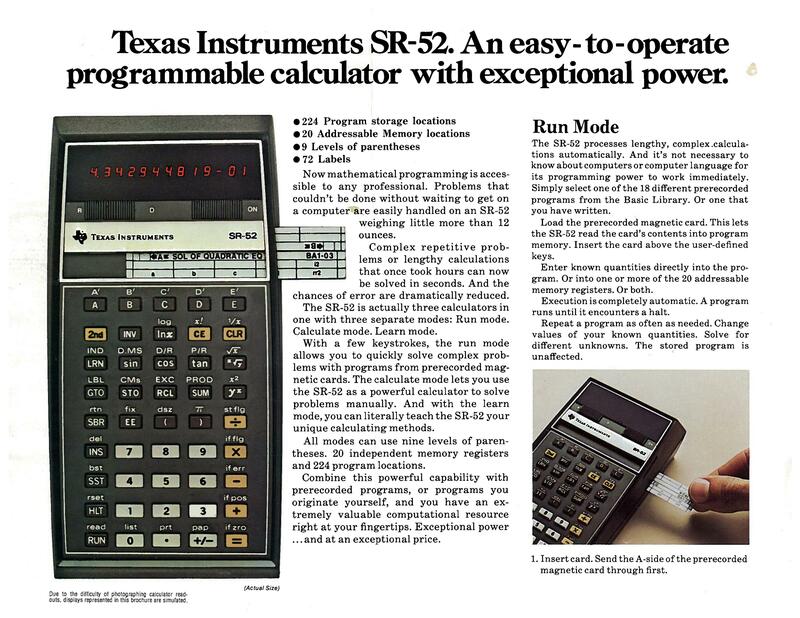 The SR-52 came with pre-produced programs, as well as a host of built-in hardware functions familiar to modern users of scientific calculators. 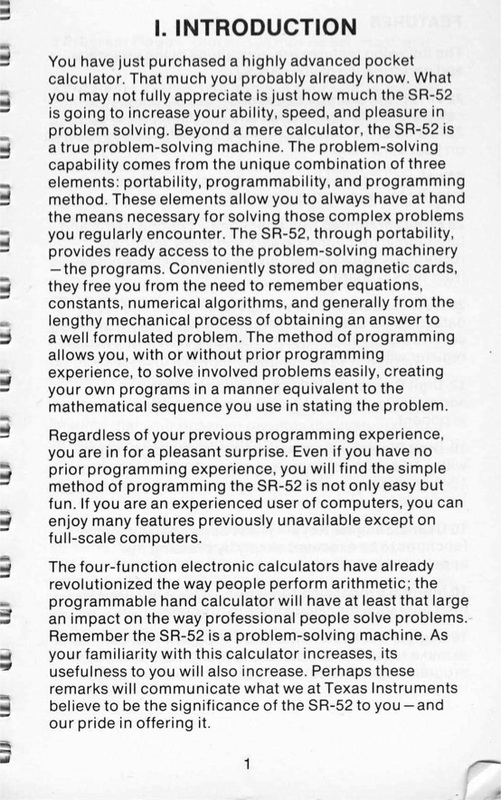 The SR-52 also could be connected to a printer unit to give it the sort of functionality of HP’s biggest desktop calculators. 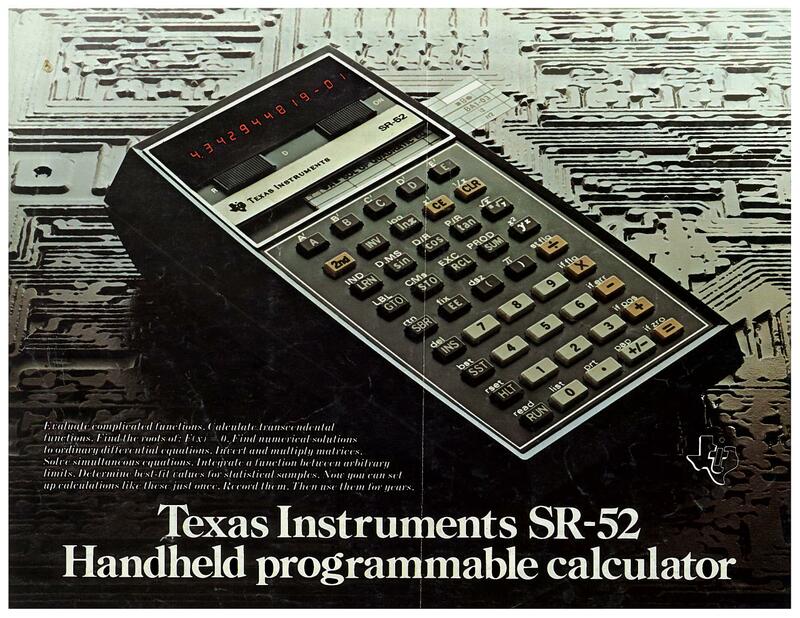 Texas Instruments, Inc. was a longtime defense contractor that moved into consumer technology as both the transistor (TI invented the silicon transistor and developed the first consumer transistor radios in 1954) and microchip revolutions heated up. 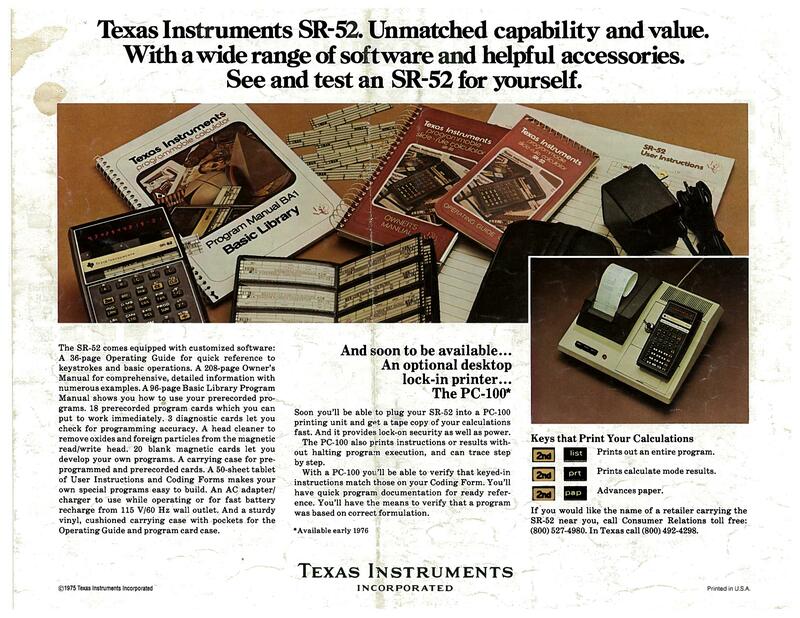 While the company did start off a little behind its Silicon Valley counterparts on personal computing, the “Silicon Prairie” caught up in the consumer sector in the late ’70s, pioneering not only in handheld calculators, but also speech synthesis (invented at TI and used memorably in their Speak & Spell unit, which debuted in 1978), and personal computing. Texas Instruments’ TI-99 series of home computers (the TI-99/4 in 1979 and the more successful TI-99/4A in 1981) used solid state cartridges like the Atari 2600 and other video game systems to be more user-friendly than floppy disk or cassette tape-based competitors. The TI-99/4A was explicitly marketed, like the Speak & Spell, as an educational tool. The SR-52 cost $395 on release in 1975. In today’s dollars, that’s roughly $1,788. I still have a TI-89 and my four year old plays speak and spell on my Samsung tablet for me.